What are Error #268D3 ads? Error #268D3 ads are usually shown to users when they enter an untrustworthy website having a purpose of convincing people that there is something wrong with the computer and, consequently, it has been blocked. Alternatively, users can see it appearing on their screens from time to time if they have allowed some kind of malicious program to enter the computer. 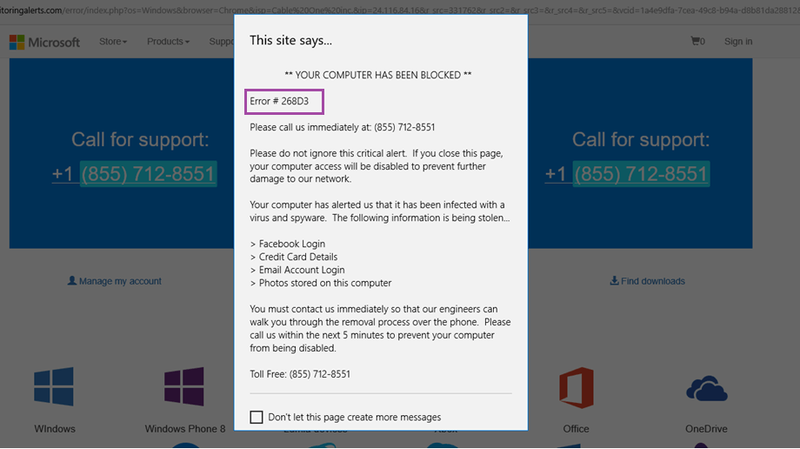 These Error #268D3 ads are only shown to users to scare them, so do not believe that problems have occurred and your PC has been blocked because of that even though you notice that you cannot access your Desktop. It will no longer be like that after you delete a malicious program from the system. This is the only way to remove Error #268D3 ads. Of course, it is easier to delete Error #268D3 ads if they are shown to you because you visit untrustworthy websites. You just need to stop doing that and they will not appear on your screen again. In other words, you just need to close your browser and make sure that it does not open websites from the previous browsing session. What do Error #268D3 ads do? Error #268D3 ads are distributed to scare users into believing that there is a problem that needs to be solved. Cyber criminals seek to make users call the telephone number (855) 712-8551. This number should belong to the technical support; however, it is more likely that you will make a call to cyber criminals. They might offer to solve this computer program for you for a certain price or you will have to purchase a particular application. Also, they might try to get personal details from you and then might sell this collected data. Therefore, you should go to uninstall Error #268D3 ads yourself. It is hundred times better than calling the so-called technical support which only seeks to extort your money and find out something personal about you. How did malware showing Error #268D3 ads enter my computer? All malicious applications are very sneaky, so it is not surprising that the one showing Error #268D3 ads has secretly entered your PC and started doing its job, i.e. disseminating Error #268D3 ads. In most cases, programs showing ads are ad-supported applications (adware) that usually enter computers bundled with freeware in software bundles. Users are the ones responsible for the entrance of these threats. They carelessly install new applications and often do not have a tool to protect their computers from malware. Go to acquire one if your PC is unprotected too because there are much more serious infections out there. How to delete Error #268D3 ads? To remove Error #268D3 ads from your screen and thus be able to use the computer normally, you should go to get rid of malware showing them. This is the only way to implement the Error #268D3 ads removal once and for all. Unfortunately, we cannot promise that it will be very easy to implement the Error #268D3 ads removal because malware might be quite hard to detect and erase. Therefore, we suggest using an automatic malware remover.